Trusses are a common system used to support structures over a large span of space. It consists of a frame of axially loaded members that are either in tension or compression and are interconnected at the joints. Trusses are structurally engineered to be efficient structural systems where every component is critical to the long-term durability and strength of the truss. Historically, trusses have been constructed of either timber or steel. In residential construction, timber roof trusses have been used for decades to support floor and roof systems. This article will focus on timber roof truss design in residential construction. Trusses have several key components; chord members, web members, and connections. The chords are located at the top and bottom of the truss. The bottom chord is generally always under tension load, similar to the string on a bow; while the top chord is generally under compression. The web members transmit the tension/compression forces to both chord members. The web members also establish the depth of the roof truss. Deeper trusses have the ability to span longer distances due to the increase in lever arm between the top and bottom chords. All members have to be adequately connected to transmit the axial forces between the chords and web members. Connections in timber trusses are typically made of steel gusset plates. 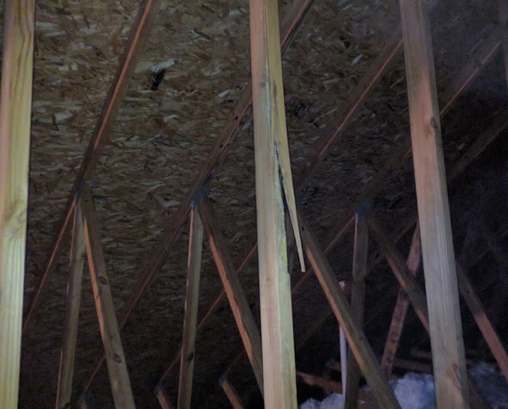 Common truss design issues experienced in residential construction include broken web/chord members along with broken connections. Due to redundancy in framing in residential construction, truss failures due to overloading are rare. Instead, broken members and/or connections typically occur during transport of the roof truss to the site or during erection of the truss. Figures 1 to 3 below are examples of broken web members, split chord members and dislodged connection plates. 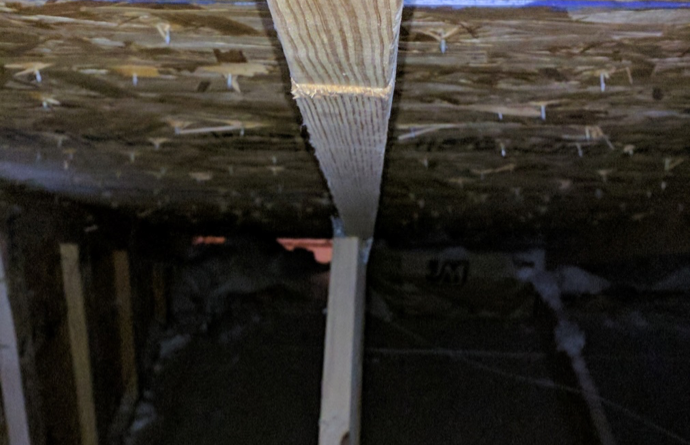 We have also encountered issues with a roof truss design that have been modified to provide attic access stairs, install HVAC and other utility equipment. The modifications were typically done with a lack of care and understanding of the impact on the overall structural integrity of the roof truss. Trusses with broken or modified members should be repaired to restore the integrity of the truss. There are a number of ways to repair trusses and the methods of repair will vary depending on the truss component that is broken. For example, broken web and chord members may simply require the addition of supplemental framing on either side for the length of the member while dislodged gusset plates may require new plates be installed or a supplemental wood gussets be installed around the connection joint. It is important to note that trusses are engineered items and that repair or alteration of a truss cannot be made without the written approval of a licensed professional engineer. The building code is very clear that any changes, modifications or repairs to a truss design should be in accordance with a design by a licensed professional engineer. Should you have a damaged or modified roof truss, we recommend you contact a local, licensed professional engineer who can assist in reviewing the truss and designing the appropriate repair. Additionally, if you are planning to modify trusses to provide additional attic access, install utility equipment, etc…, we strongly recommend a licensed professional engineer, like Structural Innovations Engineers, be consulted during the planning process. The engineer can provide a written repair plan in support of the changes. All engineered truss repairs should be implemented by a licensed general contractor and inspected by the local building authorities.